The self-driving car industry may be shifting gears. 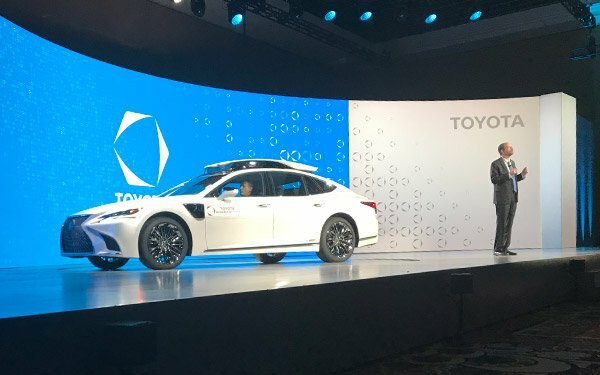 At CES last year, Toyota president Akio Toyoda, the third generation Toyoda leading the auto giant, took the stage to detail the major transformation Toyota was undergoing. “My goal is to transform Toyota from a car company to a mobility company,” Toyoda said at the time. Toyoda then introduced his vision for future mobility, comprising self-driving, all-electric, ride-sharing vehicles using Toyota’s new concept vehicle. The e-Palette concept vehicle is designed to run using technology from Toyota or those from other companies as well. At CES this year, Toyota seems to be modifying, if not shifting, its position on self-driving cars with an emphasis now on creating technologies to help people drive better rather than having cars drive themselves. This is a major shift. While working on fully autonomous vehicles, what Toyota calls Chauffeur systems, it simultaneously has been working on Toyota Guardian. The idea of Guardian, which Pratt said Toyota will make available to the auto industry, is that the driver is in full control of the vehicle with Guardian there to coach and, if necessary, temporarily intervene. An example shown in a test track presentation simulated a car abruptly cutting off a moving vehicle. To avoid a crash, the Guardian checked for objects ahead and sped up to go around the vehicle, quickly returning to its path and to driver control. It all happens in an instant. “The joy of driving is real,” Pratt said. Rather than showing concept vehicles that will drive themselves as in last year’s presentation, Gill introduced the TRI-P4 research vehicle, a modified Lexus LS-500h loaded with sensors to learn how a car can best assist its driver in the future. “We think the most important benefit of automated driving is not about the autonomy of cars, it’s about the autonomy of people,” Pratt said. What a difference a year -- along with a lot more knowledge -- can make.